Your Two Night Discount Voucher for Up to 30% Off a Yosemite Pines Resort Vacation is Good for 1 Year* Lock in Your Rate Now! We want you to have plenty of time to plan your vacation with your discount voucher, so all vouchers are good for one year from date of purchase for any night of the week. * You may purchase 2 vouchers, good for 4 nights. We are just a beautiful 22-mile drive from the western Gate of Yosemite National Park. There are plenty of on-site activities including a seasonal swimming pool, volleyball and bocce ball courts, and our delightful Petting Farm. 209-962-7690 to reserve with your voucher number. 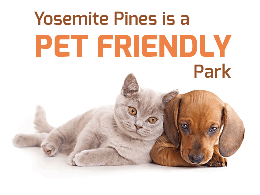 For full description of all lodging, click on the Visit Yosemite Pines Resort website. We make vacation planning affordable and easy! *Some restrictions apply. Click here for details. Our variety of comfortable Yosemite cabins sleep up to eight people and we offer Yosemite lodging priced for all budgets. Cabins and yurts for an exceptional value! Beautiful RV sites with full hook-ups, picnic tables and barbeques. RV and Tent campers have plenty of on-site activities. Nearby attractions for a fabulous experience. No need to pull an RV to our Resort. Our variety of on-site renovated and new Retro trailers are brimming with nostalgia. The luxurious Conestoga Wagons sleep either four or six people and re-create the ‘Pioneer Spirit’ with comfort of modern day lodging.